An interactive, talking globe that children can use to quiz themselves with over 10,000 geography questions. 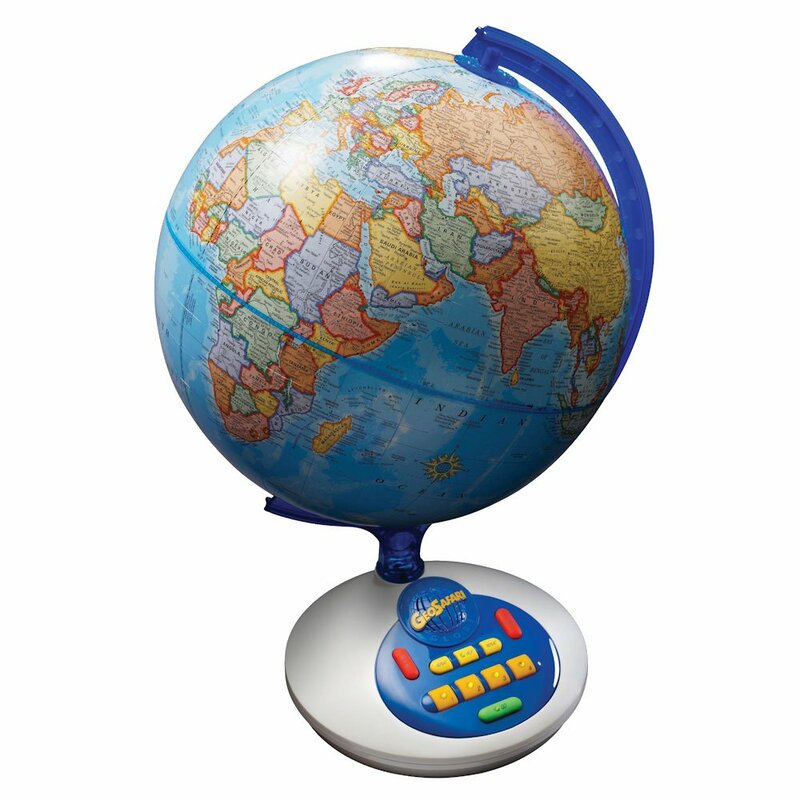 A globe attaches to the talking base, which has over 10,000 geography questions. It runs on four C batteries, unless you purchase the AC Adapter. While a number of users have been pleased, a number have expressed frustration regarding the questions, and the details (or lack thereof) on the globe itself. There are three question modes: one for questions on the USA and Canada only, a second mode for questions about the rest of the world only, and a third mode that combines the other two sets. A plastic globe with 10,000 geographical questions about different areas in the world. There are three settings- World, USA and Canada, and World + USA and Canada. Children can answer the questions and quiz themselves on what they know about each area. There are three different modes- United States and Canada, World (excluding United States and Canada), and World + United States and Canada. Children can choose which mode that they want to play in and then the globe will start asking them questions that relate to the area that they chose. 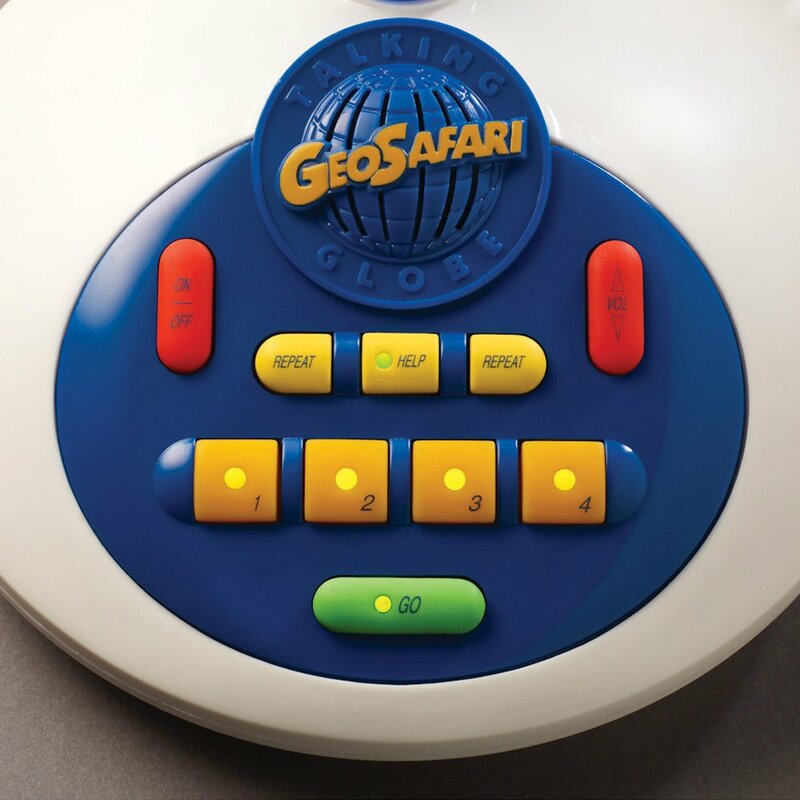 The Geosafari Talking globe has 10,000 different geography quiz questions. Several users have reported these questions being frequently repeated, to the point that it seems there are only between 150 to 200 actual questions. According to the instructions, the globe is supposed to give the correct answer if a multiple choice question was answered incorrectly, though some users have said that it doesn't happen. The globe is not supposed to give a correct answer to a question with only two answer options, which makes sense. Some users have reported that sometimes a question is asked that cannot be answered by looking at the globe. For instance, it may ask a question about a river located in some country, but that river is not shown on the globe. This turns the question into a guessing game. An AC Adapter can be purchased seperately to keep from buying the four C batteries, which are not included. There have been mixed feelings on how truly educational this globe is. For kids who want to get a visual understanding of where countries are physically located, then this is great. Of course, for those purposes, any globe without electronic components would work equally well. The questions cannot be changed in their difficulty level, and some users feel that this is really only age appropriate for children around the 4th grade. There is no way to download additional questions. Because the questions often get repeated, and it's not always clear what the correct is, and some of the questions can't be answered without outside sources, we feel this globe is not really any more educational than a regular globe. We also noted that the sound qualtiy was not the best. Sometimes it is hard to tell what question is being asked. This is helped when the globe is being used with headphones. Overall, we were not impressed. A regular globe could be used in place of this one. Requires either four C batteries, or the AC Adapter, neither of which are included. Several users had complaints that the same questions are always asked and repeated. The globe doesn’t always give children the correct answer when they get it wrong, which really affects its educational potential.